Injury-hit Warwickshire made the most of their England reinforcements as they steadily piled up the runs on the first day against Sussex at Hove. Jonathan Trott was 87 not out at stumps, having shared a 131-run third-wicket stand with Ian Bell (58), after opener Varun Chopra had also made 87. Warwickshire have confirmed that Oliver Hannon-Dalby batted with a broken arm for the vast majority of his 78-minute, match-saving innings against Somerset at Taunton on Sunday. The winter signing from Yorkshire suffered an undisplaced fracture of the ulna after being hit on the forearm by fast bowler Alfonso Thomas in the first over of his 51-run unbroken last-wicket partnership with Rikki Clarke. "There was a great deal of publicity several years ago when Stuart Pearce carried on playing in Premier League match with a broken leg. Olly's innings in Taunton is right up there with that," said Bears director of cricket Dougie Brown. "He's a tough lad and a great character." Hannon-Dalby, who is now out for three weeks, is joined on the sidelines at Hove by his Taunton last-wicket partner Clarke, skipper Jim Troughton (shoulder) and opener Ian Westwood (ankle). But Trott was dropped at slip by Ed Joyce when he had made just a single. 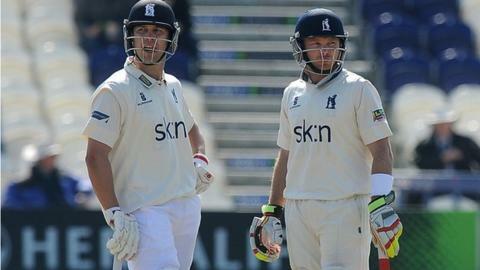 And, after claiming two late scalps, Chris Jordan then also had Tim Ambrose dropped as the Bears closed on 276-4. Ambrose was put down at second slip in the day's final over after Jordan brought Sussex back into the game by having both Bell and nightwatchman Chris Wright caught behind in quick succession. Will Porterfield, originally left out of the 13-man squad that travelled to Hove, had also earlier weighed in with 33, having been reprieved when the Bears were forced into leaving out injured skipper Jim Troughton and all-rounder Rikki Clarke, as well as opener Ian Westwood. Sussex suffered a blow before the start of play, with Steve Magoffin ruled out through injury, allowing Bears old boy Andrew Miller to make his debut against his former county. But Miller, released by Warwickshire last September, finished wicketless, his 18 overs going for 60. England keeper Matt Prior was back behind the timbers for Sussex, having fielded at first slip during most of last week's game at The Oval. "The old cricket maxim 'hold your catches, win your matches' was certainly true at Hove. "Sussex skipper Ed Joyce dropped a regulation chance at third slip when Jonathon Trott had scored just a single, and he will look to punish Sussex further on the second day. "Chris Jordan was the pick of the Sussex bowling, extracting bounce and pace from a benign wicket, and he was rewarded with two late wickets including that of Ian Bell. "However, two should have been three as another chance went down in the slips in the final over, leaving the reigning champions with a slight advantage at the end of day one." "Despite the loss of two wickets just before the close, Warwickshire acting captain Ian Bell will be happy with the first days work. "On a slow pitch offering some variable bounce, patience was required from batsmen, and Jonathan Trott has that quality in abundance. "He has looked serene in the middle, although he was dropped on one. "Warwickshire will hope Sussex pay dearly for that error, and for putting Tim Ambrose down on nought."